Sandslash in game: 605 Who? Important notice! Pokemon Sandslash is a fictional character of humans. 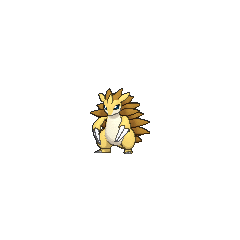 Sandslash is a bipedal, ground dwelling pholidote Pokémon. 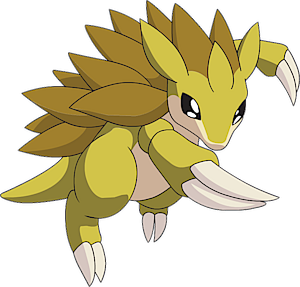 Although Sandslash is usually bipedal, it can run on all fours. Most of its underside is light yellow with a white underbelly. It has a narrow muzzle, almond-shaped blue eyes, and a thick tail. Its back is mostly covered in sharp, brown quills formed from its tough, dry hide. It has two large claws on its paws and feet. These claws are its primary weapons, and are used for slashing. They can also be used for burrowing. Its claws and spikes can both break off and are shed regularly, but grow back quickly. It can curl into a large ball to protect its white underbelly. In this position, it can roll to attack or escape and protect itself from heatstroke. 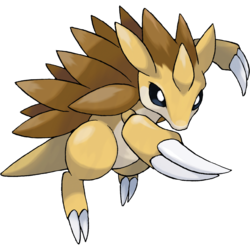 Sandslash is also adept at climbing trees, and is prone to ambush its enemies from above. Sandslash can mostly be found in deserts. In the Alola region, Sandslash has an icy blue hide and quills covered in ice. These quills stand taller than a regular Sandslash's quills, and resemble icicles. This Pokémon uses its hide for camouflage in the snow, while leaving only its spines exposed. Its forepaws are larger than its counterpart, and its claws are longer, thinner, and hooked at the tips. Despite the weight of its ice-covered body, Alolan Sandslash is able to move swiftly by carving a path in the snow with its claws. This Pokémon tends to live in the deeper parts of snowy mountains, where climbing is forbidden. However, the sprays of snow it kicks up are popular shots for photographers. In Good 'Quil Hunting, a Pokémon Trainer named Koji informed Ash about a place that was good for catching Cyndaquil. After Ash captured a Cyndaquil, the Trainer challenged Ash to a 1-on-1 Pokémon battle to determine who would keep the Cyndaquil. Koji used a Sandslash against Ash's Cyndaquil and lost. In Bulbasaur... the Ambassador!, several Sandslash helped dig a new lake for the Grass-type Pokémon at Professor Oak's Laboratory. Sandslash first appeared in The Flame Pokémon-athon!. A Sandslash appeared in Round One - Begin! under the ownership of a Trainer competing in the Indigo Plateau Conference. 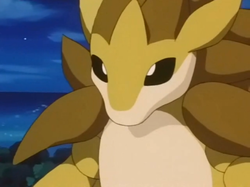 Sandslash also appeared in The Power of One. A Trainer's Sandslash appeared in Hello, Pummelo! in a photograph inside the Palace of Victory. A Sandslash was part of the Pokémon Swap Meet in Tricks of the Trade. Pietra used her Sandslash for her digging project in Right on, Rhydon!. A Sandslash also appeared in Celebi: Voice of the Forest. 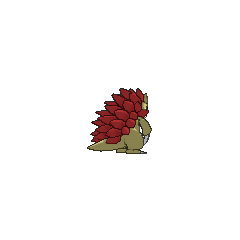 A Sandslash was seen in the wild in The Legend of Thunder!. A Sandslash made a brief cameo along with a Sandshrew in Destiny Deoxys and Giratina and the Sky Warrior. 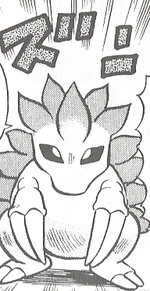 Sandslash also made a cameo in Numero Uno Articuno as a Pokémon belonging to Noland. A Sandslash appeared in the opening Lucario and the Mystery of Mew. In Gymbaliar!, a Trainer used a Sandslash to battle a wild Croagunk under Jessie's command. A group of Sandslash also appeared in Historical Mystery Tour!. A Sandslash appeared as a silhouette in SM003. A Sandslash appeared in a flashback in File 2:Cubone. Sandslash first appeared in Sea Sea Seadra where a wild Sandslash and Weezing appeared behind Bill still showing the ecology in Viridian Forest hasn't changed back to normal in two years. 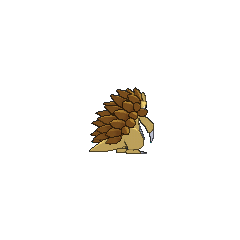 In A Flaaffy Kerfuffle a Sandslash appeared where it was one of the Pokémon in Professor Oak's fantasy when he explains that trainers should only have six Pokémon with them. Cantonese Chinese 穿山王 Chyūnsāanwohng A portmanteau of 穿山甲 and 王. Literally "King of going through mountains"